This article is about Pac-Man's appearance in Super Smash Bros. Ultimate. For the character in other contexts, see Pac-Man. Pac-Man (パックマン, Pac-Man) is a playable character in Super Smash Bros. Ultimate. He was confirmed on June 12, 2018. Pac-Man is classified as fighter #55. Play VS. matches, with Pac-Man being the 49th character to be unlocked. Clear Classic Mode with Kirby or any character in his unlock tree, being the third character unlocked after Jigglypuff. Have Pac-Man join the player's party in World of Light. With the exception of the third method, Pac-Man must then be defeated on Pac-Land. Due to his low tier standing in Smash 4, Pac-Man has been significantly buffed with a few nerfs. One of Pac-Man's biggest buffs involve his infamous tether grab, which players panned as the worst in Super Smash Bros. 4 due to its lag and hitbox issues. It is now significantly faster overall, acts as one continuous hitbox instead of separate short-lasting ones, and is more in line with the cast due to the universal increase to grab ending lag, eliminating his worst weakness and now gives him one of the better tether grabs in the game. Additionally, Bonus Fruit now cycles significantly faster and allows Pac-Man to charge cancel by jumping, giving him more options and speeding up a previously slow-charging projectile, and can also be cycled if he holds a fruit he previously dropped. The Fruit Recycling technique allows Pac-Man to constantly pressure with his Bonus Fruits by allowing him to switch fruits and setup new combos after catching a fruit, and the Bell fruit can now paralyze opponents if Z-dropped as well, granting a new item setup. Other improvements come in the form of changes to his mobility, as his overall speed is faster than before, patching his mediocre speed in Smash 4. His recovery is longer, as Power Pellet is faster and less punishable, grants even more distance, and has less lag on a wall collision. He has also received an abundance of buffs to his standard moveset: his tilt attacks have less lag, and some of his best aerial combo initiators (such as neutral aerial and forward aerial) have altered knockback, allowing his attacks to flow better into each other. The universal reduction to landing lag further improves his respectable combo ability by allowing him access to his quick aerials, while the ability to dash cancel ground moves lets him approach with his tilts. Some of his attacks have new benefits, with moves such as down tilt being less punishable due to momentum changes, dash attack hitting one extra time while keeping its safety, down aerial connecting better and doing more damage, and his new up tilt reaching higher while also being much faster. Finally, his mediocre KO potential has been improved, as his punishable smash attacks have less startup, Power Pellet's fully charged sweetspot is much stronger, and the aforementioned buffs to Bonus Fruit allow Pac-Man to access the Key projectile more easily. However, Pac-Man received several nerfs that affect his combo game. The mechanics of his Bonus Fruits have been changed in many ways, severely limiting the variety of item techniques he can perform: the time window for catching fruits is now very narrow, as most of the fruits disappear almost immediately after hitting an opponent, while the Cherry and Strawberry now have a set distance and no longer linger on the ground. Z-dropped fruits cannot be picked up again, and with the changes to footstools and locks, Pac-Man can no longer perform his notorious zero-to-death footstool combos. While all these changes prevent the opponent from capitalizing on his own fruits, it also makes his item-camping play even more straightforward. Fire Hydrant's physics have also been changed, as it loses more momentum and height from each bounce, making it less effective for coverage and setups when sent flying. His new up tilt is more situational than his previous up tilt, as it can no longer hit opponents directly next to Pac-Man, and it is unable to hit his Fire Hydrant to send it at a backwards angle. Neutral and forward aerials can no longer lock, removing lock followups, though this is compensated by their adjusted knockback values which allow them to combo at a wider percent range. Pac-Jump is even more exploitable than before, as opponents can now hit the trampoline to reduce its uses. Finally, Pac-Man retains many of his former issues despite his buffs, such as lack of range and a dependence on setups to KO. Overall, Pac-Man's moveset is now more consistent for fighting against close confrontations, and his tools have been improved to keep up with the fast pace of Ultimate. The changes overall make Pac-Man a significantly more formidable fighter, though his playstyle has less of an emphasis over item stalling and rewards item positioning and setups more than before. Overall, Pac-Man fares better with Ultimate’s cast compared to the previous game, as Pac-Man's tournament success has been strong; notable players such as Tea and Sinji have achieved noteworthy results with him, such as the former placing 13th at Frostbite 2019, and the latter placing 7th at Collision 2019. As with all veterans returning from SSB4, Pac-Man's model features a more subdued color scheme. Pac-Man's boots now have well-defined soles on the bottom. Like most of the cast, Pac-Man is more expressive, now not being limited to simply smiling and surprised expressions. He now shows an angry look when using smash attacks, looks disappointed if his grab misses, and appears panicked while drowning. His mouth also briefly opens when he stands up from a crouch. Pac-Man's on-screen appearance has been slightly altered, now doing a slow chomp in his 8-bit form, before jumping into his modern form. In Smash 4, the chomp is quicker and stops once Pac-Man opens his mouth once. Namco Roulette's animation is faster. Its roster includes the exclusive characters from both the Wii U and 3DS versions. Additionally, Heihachi Mishima from Tekken and The Prince of All Cosmos from Katamari Damacy have been added. Side taunt has been altered to show Pac-Man alternating chomps left and right twice, instead of twice on one side before turning. Pixelated fairies from Pac-Land appear during Pac-Man's down taunt in place of Blinky and Pinky. A fairy now appears in his Pac-Land-inspired victory animation. Like all characters, Pac-Man's jumpsquat animation now takes three frames to complete (down from 5). Pac-Man walks faster (1.045 → 1.097). Pac-Man dashes faster (1.52 → 1.672). Pac-Man's initial dash is much faster (1.6 → 1.87). Pac-Man's air speed is slightly higher (1.04 → 1.092). Neutral attack's first hit deals slightly less damage (3% → 2%). Up tilt has an altered animation, it is a quick upwards punch. Up tilt has more vertical range. Up tilt has much less ending lag (FAF 34 → 25) and deals less knockback, improving its combo potential. Up tilt deals slightly less damage (7% → 6.5%). Pac-Man's fist also has one less frame of intangibility (frame 6-10 → 7-10). Up tilt's hitbox is located on Pac-Man's fist. As a result, it has a smaller hitbox and much less horizontal reach, missing most characters on the ground even if they stand directly next to him. Due to the same factors, Pac-Man's new up tilt can no longer be used to knock Fire Hydrant backwards. Down tilt has less ending lag (FAF 29 → 27). Down tilt deals less knockback. Down tilt sends Pac-Man forward, then back to where he started. This makes the move significantly more safe in terms of positioning, but also removes its ability to pseudo-crawl. Dash attack hits four times instead of three. All hits after the first one have less startup lag (20/30 → 19/28/37) and the last hit has comparatively less ending lag (FAF 42 → 46). Dash attack deals more damage if all hits connect (9% → 10%). The last hit deals less damage (5% → 4%), weakening its KO power. Forward smash has less startup lag (frame 18 → 16). Its duration remains unchanged, giving it more ending lag. Forward smash deals more knockback (KOs Mario at 81% → 72% from the edge of Final Destination). Both hits of up smash have less startup lag (frame 13/16 → 11/15). Down smash has less startup lag (frame 18 → 15). All aerials have less landing lag (Neutral: frame 12 → 7, Forward: 16 → 10, Back: 22 → 13, Up: 16 → 10, Down: 20 → 12). Neutral aerial deals significantly less knockback. Coupled with its lowered landing lag, it can combo consistently. Neutral aerial has lost its weakest hitbox that dealt 3%. Neutral aerial's lowered knockback removes one of Pac-Man's former KO options, as it can no longer KO until the 180% range. All hitboxes of neutral aerial can no longer lock opponents. Forward aerial deals more damage (5.3% → 7.65%). Forward aerial has more base knockback but much less knockback growth, increasing the percent range in which the move can combo. Due to the changes to its knockback, forward aerial can no longer lock opponents. Up aerial has an altered ending animation. Down aerial's hits transition faster, with 1 frame less lag between each one. Down aerial has less ending lag (FAF 60 → 50). Down aerial deals more damage (1.5% → 2% (hits 1-3), 6% → 7% (hit 4), 10.5% → 13% (maximum)). Down aerial's final hit has more horizontal knockback, giving it edgeguarding and KO potential offstage. Down aerial's final hit always sends in the direction Pac-Man is facing, improving combo potential. Grab's tractor beam has a smoother extending and receding animation. If the grab misses, Pac-Man will look disappointed. Grab has significantly less ending lag (FAF 76 → 59). Grab's blind spots have been removed. Grab has one long-lasting hitbox instead of multiple short hitboxes (frames 12-14, 22-24 & 32-39 → 12-36). Pummel is much faster but deals less damage (3.25% → 1.2%). Forward throw deals more damage (6% → 8%) and knockback, however it still lacks KO potential. Back throw has a visible wind effect while Pac-Man spins. Up throw has less ending lag (FAF 45 → 38), giving it combo potential, allowing followups into neutral aerial or Pac-Jump at 0%, or up aerial from around 0-60%. It can also start damaging setups at 0% with the aid of Bonus Fruits and down aerial. Down throw is performed significantly faster, making it better for tech chases and gives the opponent less time to DI. All Bonus Fruit except the second and third fruits cycle significantly faster (Apple: frame 54 → 52, Melon: 78 → 72, Galaxian: 102 → 92, Bell: 126 → 112, Key: 150 → 132). Bonus Fruit can be jumped or air dodged out of while charging. Cherry, Apple and Key deal slightly more damage (Cherry: 4% → 4.3%, Apple: 9% → 9.5%, Key: 15% → 16%). When Z-dropped, Bonus Fruit's Bell can stun the opponent. If Pac-Man grabs a fruit he's previously thrown or dropped, Bonus Fruit is able to be recycled through the items again.. This allows him to store his items in a similar manner to Pocket, create possible setups from his Bell to his Key, reduce the opportunities for his opponents to use his fruits against him, and keep up pressure with his more powerful fruits for a longer period of time. Bonus Fruit's new recycling mechanic allows fruits to be caught again if they are charged slightly before throwing, as they are considered a newly generated item. Bonus Fruit's Strawberry and Orange take slightly longer to charge (Strawberry: frame 19 → 20, Orange: frame 29 → 32). Orange and Bell deal slightly less damage (Orange: 8% → 7.5%, Bell: 8% → 7.5%). Cherries and Strawberries have a limited airtime before they disappear automatically, significantly lowering their maximum distance. It is no longer possible to bounce them off platforms to extend their lifetime. Key deals slightly less knockback (KOs Mario at 100% → 104% from the edge of Final Destination). Bonus Fruit's items can only be Z-dropped once before being unable to be recatched by anyone. Dropped fruits (either from being thrown or if an opponent knocks it out of Pac-Man's charge process) will only bounce once before disappearing instead of lingering on the floor for around three seconds. This makes it difficult for anyone to take advantage of dropped fruits, and significantly limits fruit-catching methods. Bonus Fruits that hit an enemy pop into air for a much shorter time, making it much harder to recatch fruits after hitting enemies and it makes it harder for them to grab it in the air. The sprites used during Bonus Fruit have been redrawn with thinner outlines. If Pac-Man tries generating a fruit while one is in play, a pixelated "pop" effect will display instead of a puff of smoke. Power Pellet has been sped up overall. All variants of Power Pellet travel further, with the fully-charged version traveling almost the full length of Final Destination. Fully charged Power Pellet's sweetspot is much stronger, and can KO at 110% at the middle of Final Destination. Power Pellet has less ending lag when colliding with a wall. Pac-Man's afterimages when using Power Pellet go from yellow to orange and then red. Pac-Man also flashes white and red after eating the power pellet. Pac-Jump's trampoline has a hurtbox. This means Pac-Jump's trampoline can be used to block projectiles. The trampoline can be attacked by other players, but not by Pac-Man. Based on the power of the attack, the trampoline's uses will be reduced, from as little to one use or all uses. Pac-Jump's trampoline comes out on frame 10 rather than frame 1, so the move is no longer unblockable. Pac-Jump's attack damage increases with time, similar to Dr. Mario's neutral air (Early: 7% → 5%, Middle: 6%, Late: 5% → 7%). Pac-Man's afterimages when using Pac-Jump are more visible and go from yellow to white. Fire Hydrant has altered physics, acting heavier and losing more height and speed from each bounce. Fire Hydrant's heavier physics makes it easier to hit grounded opponents. Fire Hydrant's new physics significantly reduce its overall coverage and distance when bouncing. Super Pac-Man has been changed. Pac-Man still transforms into a two-dimensional sprite to launch enemies, but automatically moves forward and loops around the screen, slowly building up speed. His trajectory can be adjusted by aiming him up or down. He will also eat items he runs into during the move. Aesthetically, the move resembles Pac-Man Championship Edition 2, featuring pulsating lights in the background and a rising pitch as the move progresses. The universal change removing the ability to Z-drop items out of hitstun reduces Pac-Man's ability to get out of combos when holding a Bonus Fruit. Pac-Man now changes his facial expression when whiffing his dash grab and pivot grab similar to if he whiffs his standing grab. Key when using Pac-Man's Fruit Recycling Technique now cycles back to Key instead of having it disappear. Forward aerial auto-cancels earlier (frame 43 → 26), which allows it autocancel out of a short hop fast fall. Down aerial auto-cancels earlier (frame 56 → 50), matching the move's interruptibility. Bonus Fruits take longer to disappear after hitting an opponent (30 frames → 32), giving him slightly more time to grab it again. Cherry no longer disappears immediately after hitting an opponent. Bonus Fruit deals less shield damage. Fire Hydrant has more range below it when it is falling. Fire Hydrant deals less shield damage. Pac-Man can crawl and wall jump. 2% Two punches, followed by a bicycle kick. Comes out quickly (All hits are frame 4), but the third hit has some endlag, and little knockback. 8% Pac-Man kicks forward, throwing his arms back with an angered expression. Very quick (frame 5), and can kill around 160% at the edge. 6.5% Punches upward, hopping up slightly. Has decent vertical range, with little knockback and ending lag to extend combos. Cannot hit Pac-Man's sides, however. 6% Pac-Man changes into his Classic Form and chomps downward. Once the move finishes, Pac-Man returns back to his original position, making Down Tilt a safe poking tool. PAC Dash Bite 2% (hits 1-3), 4% (hit 4) Pac-Man changes into his Classic Form and slides forward, chomping repeatedly. Hits four times, with the last hit having low vertical knockback. This move has a long animation, but next to no ending lag, making it incredibly safe (even against shield). 15% (sour), 16% (sweet), 8% (late) Reels back before throwing Blinky in front of him. Has a sourspot on his arm, while the ghost itself is the sweetspot. Deals decently high knockback and damage, and has a very long-lasting late hitbox. Has some endlag, however. 3% (launcher), 14% (Inky), 7% (late) Balances on one foot while throwing Inky upward. Has a launcher hitbox in front of him. Also has a long-lasting late hitbox. Has decent knockback, but struggles to kill below 100%. 13% (clean), 6% (late) Crouches while throwing Pinky and Clyde to either side. The weakest of Pac-Man's smashes, but it sends at a very low angle (29°) for gimps. 10% (clean), 6% (late) Spins around in his Classic Form. Very fast (frame 3), and lasts a long time. Very little landing lag and knockback, so it is good for combos, but has high ending lag in the air. 7.65% Kicks in front of him. Comes out fast (frame 5), with little ending lag (FAF 26). Can chain into itself, or other moves for combos. 11.8% (clean), 7% (late) Dropkicks behind himself. Middlingly fast (frame 9), but has decent landing lag (13 frames) and very little knockback. 10% A sweeping bicycle kick above. Very long duration (frame 9-16), but has little knockback, and too much ending lag to combo reliably. 2% (hits 1-3), 7% (hit 4) Stomps below himself four times, with the last hit sending horizontally. Has massive base knockback, able to kill reliably offstage below 100%. — Pac-Man holds his hand out to produce a long tractor beam (based on Galaga). A tether grab, but cannot be used to grab ledges. Very slow (Standing: Frame 12, FAF 59. Dash: Frame 14, FAF 67. Pivot: Frame 15, FAF 62), but lasts a long time and has quite far reach. 1.3% Slams his head into the opponent. 8% Reels back, then tosses the opponent at a 59° angle. Too much ending lag to combo, and too little knockback to kill, but can be used for mixups due to its awkward angle. 11% Similar to Mario and Wario's, though it does not have a collateral hitbox. Grabs opponent and swings them around twice, throwing them behind on the second spin. Kills around 140% on the ledge. Pac-Man's most damaging throw. 5% Swings his arm upward to throw the opponent into the sky. Has little knockback and endlag so it can combo, and kills around 220%. 1.5% (hits 1-3), 6% (hit 4) Changes into his Classic Form and chomps the opponent four times, with the last hit dealing low knockback. Sends at a low angle for techchases, but has very high ending lag. 7% Kicks around himself while getting up. 5% Performs a side kick to the left and then to the right while getting up. 9% Performs a legsweep while climbing up. Bonus Fruit 4.3% (cherry), 6% (strawberry), 7.5% (orange), 9.5% (apple), 12% (melon), 9% (Galaxian), 7.5% (bell), 16% (key) Pac-Man cycles through 8 different objects, each with their own damage output, knockback, speeds, and angles. All can be recaught once, and if Pac-Man has a Fruit in his hand, pressing B will continue the cycle from that Fruit's position. Power Pellet 3% (before eating Power Pellet), 4% (uncharged), 12% (fully charged) Pac-Man summons a string of Pellets in front of him, then chomps along the trail. The string can be angled in any direction and travels very far, making it an incredible recovery option. Also has high knockback if Pac-Man hits the opponent after eating the Power Pellet. Just after eating the final pellet, as well, Pac-Man has Super Armor for a short time. Pac-Jump 5% (early), 6% (mid), 7% (late) Summons a trampoline below him, which will launch Pac-Man higher as it changes color (from blue, to yellow, to red). Any character can jump on the trampoline, but only Pac-Man will be sent into freefall from it. Anybody but Pac-Man himself can harm the trampoline (which sends it into different colors before destroying it entirely). Any character who jumps on a red trampoline will be instantly forced into freefall. Fire Hydrant 9% (falling), 13% (tumbling) Summons a Fire Hydrant, which falls downward until it hits the ground. Once grounded, it spurts water out of its sides twice (or on top, if someone is standing on it). This water pushes enemies and items away. If the hydrant takes 13% or more, it will tumble (taking the angle and speed of the move that launched it), dealing damage to anyone who gets hit by it. Super Pac-Man 20% (yellow), 28% (red) Pac-Man eats a Power Pellet and a Super Pellet, grows large, and turns into his classic 2D form before looping around the stage repeatedly. He always moves in a straight line, but his angle can be altered to catch opponents running away. As the Final Smash progresses, Pac-Man moves faster and faster, then starts acquiring a red tint, after which he deals more damage to opponents. Ultimately, he slows down before the Final Smash ends. Starts out as the classic Pac-Man sprite, makes a slow chomp, and then jumps out of it into his normal form. Side Taunt: Turns into his classic design and chomps from side to side while a sound from Pac-Man plays. Down Taunt: Lays on the ground as a 5-note jingle plays, while fairies from Pac-Land and a few music notes appear above his head. Looks at the screen and winks while giving a thumbs up, similarly to his official art from Smash 4. Appears in ball form, trips, and raises a fist. Chases a vulnerable ghost in 2D form, then poses in 3D form. Lands on the ground while a sign reading "7650" appears, then gives a thumbs up with a pixelated fairy. This pose is based on Pac-Land. A remix of the jingle that plays when starting a new game in Pac-Man, as well as completing levels in Pac-Man World 2. Bokchoyyy! - The best Pac-Man player in the Midwest. Placed 17th at Midwest Mayhem Ultimate. Kiwi - The best Pac-Man player in New England. Placed 7th at Return to Subspace 2.
kou - Notable Pac-Man player in Japan who placed 17th at Sumabato SP 2. Sinji - One of the best Pac-Man players in the world. Placed 25th at GENESIS 6, 7th at Collision 2019 and 13th at Let's Make Moves. Tea - The best Pac-Man player in the world. Placed 1st at Sumabato SP 2, 2nd at Sumabato SP, 5th at 2GG: Prime Saga, and 13th at Frostbite 2019. Pac-Man fights classic characters in accordance to their original release date. Although Pac-Man does not appear in the World of Light opening cutscene, he was vaporized and later imprisoned alongside the rest of the fighters (except Kirby) when Galeem unleashed his beams of light. By taking Marth's route, the player can find Pac-Man near a mushroom area. PAC-MAN's Fighter Spirit can be obtained by completing Classic Mode. It is also available periodically for purchase in the shop for 500 coins. Unlocking Pac-Man in World of Light allows the player to preview the first spirit below in the Spirit List under the name "???". As a Fighter Spirit, it cannot be used in Spirit Battles and is purely aesthetic. Each Fighter Spirit has an alternate version that replaces them with their artwork in Ultimate. Pac-Man using Power Pellet on Wii Fit Trainer on Super Mario Maker. Pac-Man throwing a melon on Mushroomy Kingdom. Pac-Man using his down smash on Yoshi on Big Blue. Dodging Mr. Game & Watch's Chef on Tortimer Island. Holding a tiny Olimar on Distant Planet. Getting hit by Link's Spin Attack on Spirit Train. With Olimar, Mario, and Sonic on Gaur Plain. Air dodging on Green Greens. 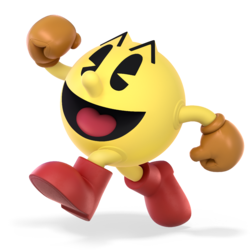 Pac-Man's stock icon, alongside that of the three different Mii Fighter types, is among the few ones that do not depict the character's head. Instead, it takes on the look of Pac-Man's original arcade sprite, which also served as a life counter in the arcade game. Instead of having recolored sections of his stock icon for his alternate costumes, his palette swaps are represented by a colored neon bar undernearth his stock icon, which appear similar to the wall sections from the original Pac-Man. Pac-Man's artwork in Ultimate resembles his artwork in Pac-Man Vs., albeit with Pac-Man angled differently. Pac-Man is unlockable in Kirby's Classic Mode column, likely referencing how the two are round balls that primarily revolve around eating enemies. In Pac-Man's showcase video, it shows that the water from Fire Hydrant can be punched out of the air, but this is not possible in the final game. Pac-Man is the only character who travels to Wrecking Crew in Classic Mode. This page was last edited on April 20, 2019, at 02:35.